Here’s Why You Should Choose The Mortimer Garden Cabin for Your Home. The superb design of this corner garden log cabin adds a new look to the ‘norm’. With the doors across the corner, it enables the maximum amount of light into the cabin as well as the maximum amount of available wall space inside. These aspects enable the greatest amount of usage to suit all your family’s requirement. If you plan to use it as a recreation room or fitness room, or as a home office, or as a ‘crash room’ for your children and their friend or as a summer room this log cabin will find all those needs. Give some thought to how much use you can get out of this cabin – you will be amazed! And no wasted space in the corner of your garden. 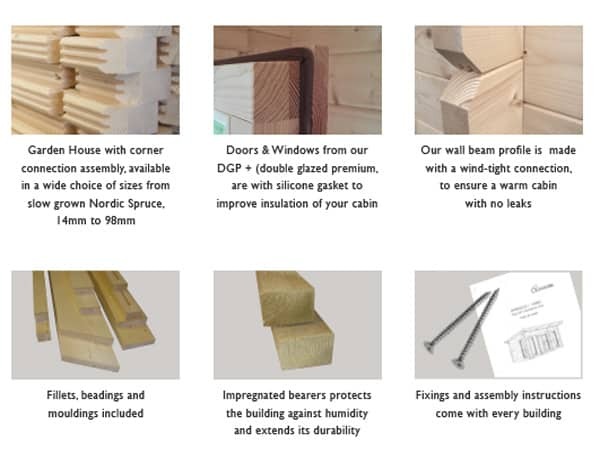 The Swedes know the secret of the Nordic timber and is used extensively in their country. The slow-growing nature of this wood makes it ideal for log cabins – being both strong and stable. These cabins benefits from this great natural material and which will enable a long life for your new cabin. The design of these ‘Ottershaw’ corner log cabins has a stylish and very attractive classical or contemporary design. I’m sure we can help as we always remember it’s your cabin and should reflect your requirements. These superb cabins can optionally be assembled for you by a third party saving you time and effort. As they do this on a regular basis your new cabin will be up very quickly and importantly correctly. Having said that it’s possible for you to assemble these buildings as everything is done to make it straightforward. The design was tested having been assembled at the factory before being flat-packed and shipped to you. By following the log cabin guidelines it can be assembled efficiently. The secret is to take your time and work through each step one at a time. Want a challenge then there you go! If not we can help along with other essential services. Size: This Mortimer corner log cabin 2.8 x 2.8m or 3.3 x 3.3m in size. Note this is the external size of the body of the cabin. The lugs extend 100mm on each corner making the overall size (as most other companies quote) 200m larger. We mention this so you know you are comparing ‘eggs with eggs’. Please check with us if internal size is crucial. Roofs: 18mm thick T&G boards used on the roof sections supported by strong roof beams. Roof beams meet EN 388 stringent standards. Untreated. Supplied with felt tiles (shingles) in either red, brown or green or Polyester based felt as standard. 20cm (2.8 x 2.8m) or 30cm (3.3 x 3.3m) overhang all round. 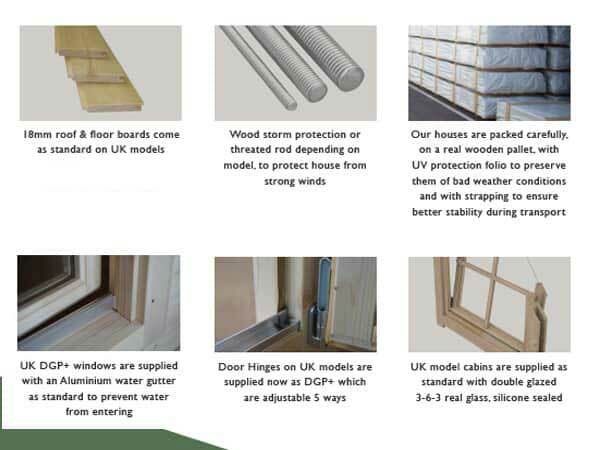 Windows: Two (2×2 joinery quality opening windows included as standard. Size of each double window is 90cm wide x 123cm high. Complete with easy adjust hinges, silicon gasket seals and delightful silver finish window handles. Supplied untreated as standard. Double glazed as standard NOT single glazed. 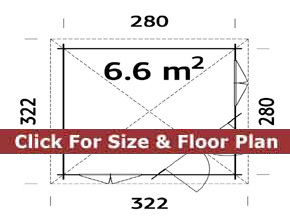 Lower Walls: Height: 222cm (2.8 x 2.8m) or 233cm (3.3 x 3.3m) – on all corner log cabin kits for sale. 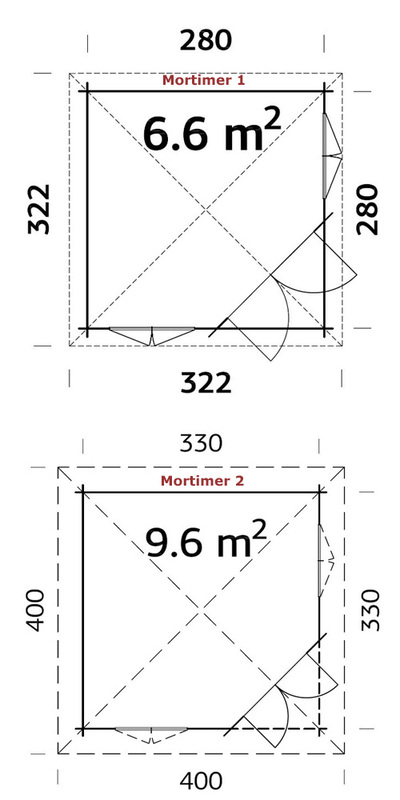 Top Height: 3.02m high (2.8 x 2.8m) or 3.25m (3.3 x 3.3m) – on corner log cabins. The Mortimer is a new log cabin in the Trentan range. Full details will be added in the next few weeks. In the mean time please contact us directly for up to date specifications.